Product Roundup I’m now of an age and hair density where the idea of standing in a muddy field in wellies, queuing to answer a call of nature, getting trench foot and eating the sort of food the troops at Passchendaele had to endure just to hear some live music has long since lost its appeal. But if in some weird parallel universe there’s another Al Taylor who does think it’s a good idea I’m pretty sure he’d want to take along some gadgetry to make the event just a little more civilised. Here then, with my through-a-blackhole namesake in mind, are a dozen handy gizmos for the 2015 festival season. 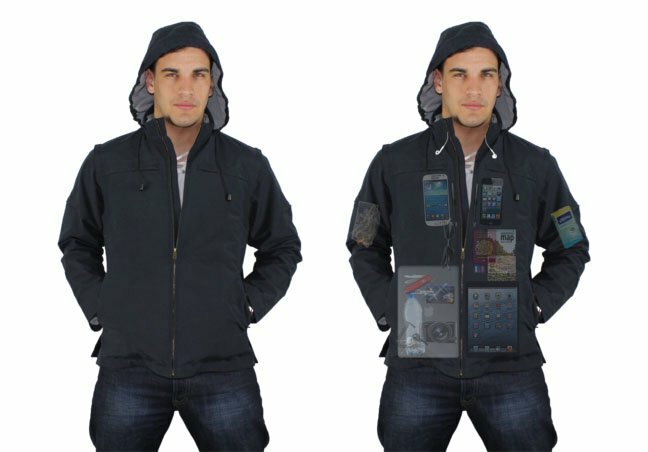 For quite some time, Scottish clothing maker AyeGear has been making jackets that let you carry a truly daft number of gadgets on your person and the new J25 is the pinnacle of its development. The clue to how many bits of kit you can pack into the J25 is in the name. Yup, 25. There are two clear-windowed inside pockets for your smartphone(s), larger pockets below them for things like tablets and e-readers and even a laptop pocket at the back for machines of up to 13-inches. You'll find sundry pockets for your wallet, shades, MP3 player (with earphone cable routing, natch), passport and who knows what else. All in all, the J25 is seriously capacious. Made from a robust and breathable blend of nylon and cotton, it’s waterproof and has a concealed hood. The sleeves unzip if you fancy a gilet rather than a jacket but the really clever thing is that it is tailored to avoid making the kit you are packing at all obvious to passing muggers or to make you resemble Quasimodo as you wear it all. I’m not usually one for flash modern tents. Anything more advanced than my faithful old Vango Force 10 – a tent with the structural integrity of a Norman keep but, unfortunately, a not dissimilar weight – is not for me. That said, this inflatable affair from German outdoors kit wallah Heimplanet is rather impressive. Just unroll, inflate and boom, instant tent. The inflatable external frame makes for a roomy interior and at 2.5kg, it’s very light. When erect it’s impressively rigid and should prove up to keeping it’s shape no matter what the conditions. Alas, cost is the drawback here. At €399 the Fistral ain’t cheap for a two man shelter and it doesn’t even come with a pump. That’s another €40. Due for release anytime now I’ve only seen the Fistral at trade shows but it’s predecessor, the Wedge, was every bit as useful and funky as it looked.